When I was a kid growing up in Stuart, one sometimes heard stories from the kids that lived in Indiantown or Palm City about “black panthers.” And someone who had seen them would swear on their mother’s grave this to be true. Supposedly these stories had been around for many, many years coming down from parents and grandparents. More recently in 2008, my first year on the Sewall’s Point commission, the town had at least three “normally colored” bobcats and multiple kittens. The sightings were very exciting but scared some residents who had moved here from up north so I started reading about bobcats in great detail. Eventually we had Dan Martinelli of the Treasure Coast Wildlife Center speak before the commission and things calmed down but my fascination with these beautiful creatures did not. I talked about bobcats a lot during this time and in the course of a discussion, one of my husband’s physician friends who lived in Palm City, with great excitement told a story of seeing a black bobcat in Palm City walk across his yard. That same year one of the Guatemalan landscape workers in the town, knowing I loved animals, struggled wide eyes to tell me about the black panther he had seen walking along a fence, close to Lake Okeechobee and the St Lucie Canal, that he had seen while fishing with his son. According to my reading there have been more reports of melanistic bobcats in Martin County than anywhere else in the country, mostly near the area of the St Lucie Canal, Lake Okeechobee and Loxahatchee. If you want to find these reports, google “melanistic bobcats martin.” These posts are not entirely scientific but they are documented. They say there have been sightings for the past 80 years. Although I never seen a black bobcat, popular lore says the exist, I believe it, and it’s certainly better documented than Sasquatch who many of my high school friends claimed to see too. 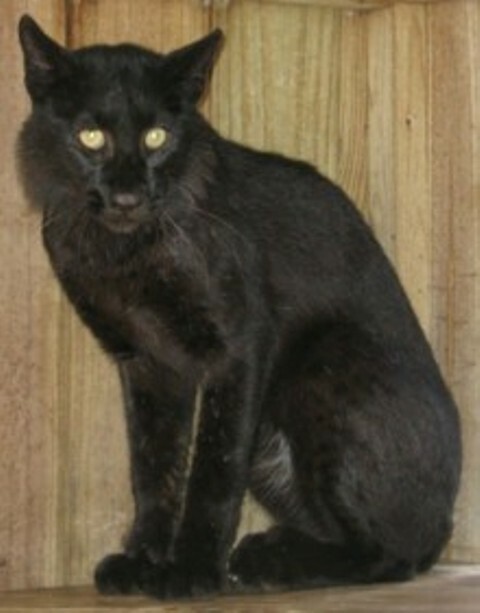 According to the Florida Wildlife Commission black panthers do not exist but black bobcats do! Nic that is such a cool story about your grandparents. Yes people do call them black panthers and they are large enough at 35 pounds for a male to really look like one; there are black panthers too I imagine. They would weigh about 100 pounds! All mammals can be melanistic or albino. It is a mutation, of ten one that helps them blend in. I had not heard about them. Our landscaper, who works from Indian River County all the way down to Boca, says also that Martin’s climate is more moderate summer and winter than nearby counties, which I have long thought too. Yes maybe that has something to do with their color. Interesting Ted! I spotted a black (melanistic) bobcat at the Oxbow Eco-Center in Port St. Lucie, Florida, at approximately 6 PM EDT on 3 April 2015. At first I thought it was a black dog, but it was shaped and moved like a cat (I’ve seen big cats before, including bobcats), and of course the stubby tail was a giveaway, but I didn’t know there were any bobcats in the area and had never heard of a black bobcat before, so to say I was surprised is an understatement. I saw it from no more than 50 feet away as I came around a bend in the trail. It was already moving away from me and quickly turned and disappeared into the brush. The coordinates (obtained later from Google maps by putting a pin at approximately the exact spot on the path where I saw the cat) were Lat +27.358379, Long -80.356682. IT was the late 70’s and I was riding my bike home late at night from babysitting. Right before my eyes was a black panther in the middle of the road. I stopped immediately and watched in utter disbelief. The panther made eye contact, and then for what seemed forever we stared at each other. It was a beautiful shiny black with green eyes, looked magical with the fog of the evening surrounding it. As quick as it had appeared, it disappeared into the foggy night. I quickly biked home, peddling in utter amazement at what I had experienced. I have seen a few Florida Bobcats over the years, but nothing like the black panther. Awesome experience. We have property in Northwest Escambia County FL that is bordered by timber company land near the Perdido River. Late yesterday afternoon, my husband and his brother were riding around the perimeter of our 40 acres in a golfcart, when a large black cat crossed about 100 ft in front of them. After google research, they believe that they saw a melanistic bobcat. Have you heard of any sightings this far north? That’s fantastic. I have not. I will ask Bush wildlife center. I believe there have been reports in north florida but very few. Your lucky day! Awesome! Please send me a picture if you get one to jthurlow@me.com and I will post and credit you! Thanks for sharing!